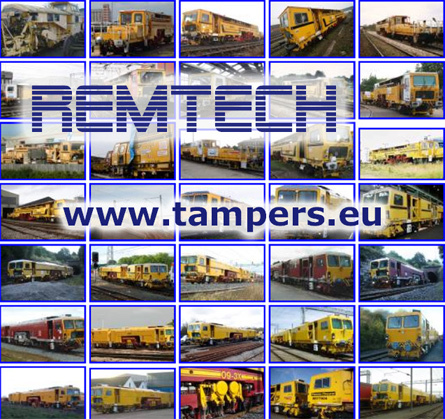 REMTECH™ has at is disposal the largest railway equipment ( over 800 items) in the world, which is considered to contain over than eight hundred positions used and rebuild – heavy railway mechanization manufactured by companies like: Plasser, Matisa, Robel, Krupp and others. - if you have in your possession railway mechanization which needs a major overhaul and/or you would like to exchange it straightaway for another mechanization which is in good working order or which have undergone an overhaul accompanied with warranty services. REMTECH™ offers the most advantageous conditions and prices on the market which are not yet offered by the companies appearing as our competitors like: Plasser, Robel and Matisa. Our offers are fairly profitable and they entirely conform to your financial requirements with all their specificities in a time of economic crisis. Your high expectations concerning warranty services are also adequately met as they are performed at your own place, twenty-four hours a day. Apart from these conveniences, we also offer additional opportunities to apply for a lease. Plasser 09-32 S - C.A.T.